Top vBlog Archives - VIRTUALIZATION IS LIFE! 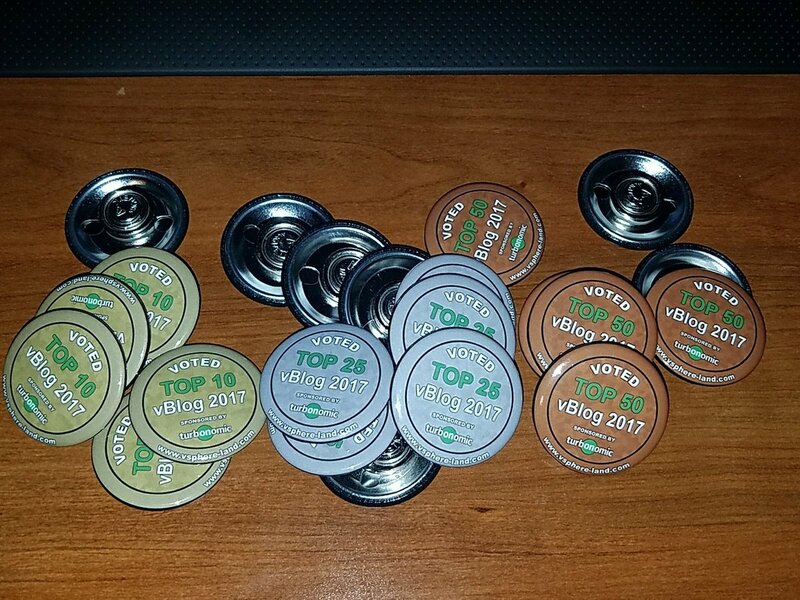 Top vBlog 2017 – Last week to Vote! As Eric mentions the vBlog voting should be based on blog content based around longevity, length, frequency and quality of the posts. There is an amazing amount of great content that gets created daily by this community and all things aside, this Top vBlog vote goes someway to recognizing the hard work most bloggers put into the creation of content for the community. Special mention to Duncan Epping and Frank Denneman for pulling out of the voting this year to give others a shot at moving up the ranks…it’s a classy move! Good luck to all those who are listed and for those who haven’t voted yet click on the link below to cast your vote. If you feel inclined and enjoy my content around vCloud Director, Availability, NSX, vSAN and Cloud and Hosting in general…It would be an honor to have you consider anthonyspiteri.net in your Top 12 and also in the Independent Blogger category. Earlier this week my good friend Matt Crape sent out a Tweet lamenting the fact that he was having issues uploading media to WordPress…shortly after that tweet went out Matt wasn’t short of Twitter and Slack vCommunity advice (follow the Twitter conversation below) and there where a number of options presented to Matt on how best to host his blogging site Matt That IT Guy. Over the years I have seen that same question of “which platform is best” pop up a fair bit and thought it a perfect opportunity to dissect the anatomy of Virtualization is Life!. The answer to the specific question as to which blogging platform is best doesn’t have a wrong or right answer and like most things in life the platform that you use to host your blog is dependent on your own requirements and resources. For me, I’ve always believed in eating my own dog food and I’ve always liked total end to end control of sites that I run. So while, what I’m about to talk about worked for me…you might like to look at alternative options but feel free to borrow on my example as I do feel it gives bloggers full flexibility and control. Virtualization is Life! started out as Hosting is Life! back in April of 2012 and I choose WordPress at the time mainly due to it’s relatively simple installation and ease of use. The site was hosted on a Windows Hosting Platform that I had built at Anittel, utilizing WebsitePanel on IIS7.5, running FastCGI to serve the PHP content. Server backend was hosted on a VMware ESX Cluster out of the Anittel Sydney Zones. The cost of running this site was approximately $10 US per month. Tip: At this stage the site was effectively on a shared hosting platform which is a great way to start off as the costs should be low and maintenance and uptime should be included in the hosters SLA. When I started at Zettagrid, I had a whole new class of virtual infrastructure at my hands and decided to migrate the blog to one of Zettagrid’s Virtual DataCenter products where I provisioned a vCloud Director vDC and created a vApp with a fresh Ubuntu VM inside. The migration from a Windows based system to Linux went smoother than I thought and I only had a few issues with some character maps after restoring the folder structure and database. As you can see above the actual usage pulled from vCloud Director shows you how little resource a VM with a single WordPress instance uses. That storage number actually represents the expanded size of a thin provisioned disk…actual used on the file system is less than 3GB, and that is with four and a half years and about 290 posts worth of media and database content I’ll go through site optimizations in Part 2, but in reality the amount of resources required to get you started is small…though you have to consider the occasional burst in traffic and work in a buffer as I have done with my VM above. The cost of running this Virtual Datacenter in Zettagrid is approx $120 US per month. Tip: Even though I am using a vCloud Director vDC, given the small resource requirements initially needed a VPS or instance based service might be a better bet. Azure/AWS/Google all offer instance based VM instances, but a better bet might be a more boutique provider like DigitalOcean. From a networking point of view I use the vShield/NSX Edge that is part of vCloud Director as my Gateway device. This handles all my DHCP, NAT and Firewall rules and is able to handle the site traffic with ease. If you want to look at what capabilities the vShield/NSX Edges can do, check out my NSX Edge vs vShield Series. Both the basic vShield Edges and NSX Edges have decent Load Balancing features that can be used in high availability situations if required. As shown below I configured the Gateway rules from the Zettagrid MyAccount Page but could have used the vCloud Director UI. For a WordPress site, the following services should be configured at a minimum. As mentioned above I choose Ubuntu as my OS of choice to run Wordpress though any Linux flavour would have done the trick. Choosing Linux over Windows obviously means you save on the Microsoft SPLA costs associated with hosting a Windows based OS…the savings should be around $20-$50 US a month right there. A Linux distro is a personal choice so as long as you can install the following modules it doesn’t really matter which one you use. The only thing I would suggest is that you use a long term support distro as you don’t want to be stuck on a build that can’t be upgraded or patched to protect against vulnerability and exploits. Essentially I am running a traditional LAMP stack, which is Linux, Apache, MySQL and PHP built on a minimal install of Ubuntu with only SSH enabled. The upkeep and management of the OS and LAMP stack is not much and I would estimate that I have spent about five to ten hours a year since deploying the original server dealing with updates and maintenance. Apache as a web server still performs well enough for a single blog site, though I know many that made the switch to NGINX and use the LEMP Stack. 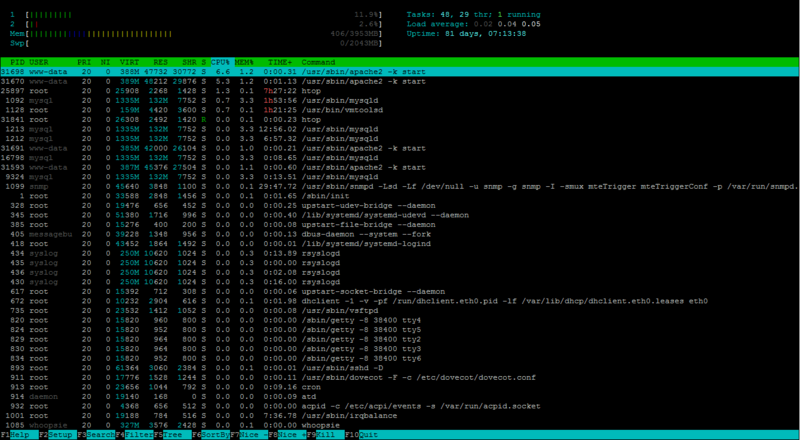 The last package on this list is a personal favorite of mine…HTOP is an interactive process viewer for Unix systems that can be installed with a quick apt-get install htop command. As shown below it has a detailed interface and is much better than trying to work through standard top. Tip: If you don’t want to deal with installing the OS or installing and configuring the LAMP packages, you can download a number of ready made appliances that contain the LAMP stack. Turnkey Linux offers a number of appliances that can be deployed in OVA format and have a ready made LAMP appliance as well as a ready made WordPress appliance. That covers off the hosting and platform components of this blog…In Part 2 I will go through my WordPress install in a little more detail and look at themes and plugins as well as talk about how best to optimize a blogging site with the help of free caching and geo-distribution platforms. The Top vBlog for 2016 Results where announced a couple of nights ago and Australia had an ok representation this year, though the number of active bloggers on the list has decreased from last year. There where 321 blogs listed at vSphere-Land.com. I know of a lot more bloggers locally so if you have a chance head over and register your site on the list ready for next year’s revamp. I’ve pulled out the Aussie Blogs and listed them below…Those with the Rank highlighted in Red are contributors to the @aussvMafia site with myself, Craig Waters, Rene Van Den Bedem and @JoshOdgers taking out a Top 50 spots this year. Those not familiar with Aussie vMafia, head here and take advantage of one of the best aggregation sites focused on VMware Vitualization going round. Great to also see three new blogs appear in the list as well. Virtualization is Life! managed to jump up 61 places from last year to #44 which is a great feeling and humble reward for the work I put into this site. It also shows that there is strong interest in vCloud Director, NSX and the vCloud Air Network in general. The list of bloggers that are ranked higher (and lower) shows the extraordinary power of community generated content. There is quality throughout! Thanks again to Eric Siebert for taking his time to go through the process and organise the voting and all the good and bad that goes with that…and thanks to all that voted! ps. Please let me know if I’ve left anyone off the list..I worked through the list in quick time so might have left someone out. While I have resisted temptation to post a blog on this years Top vBlog voting I thought with a couple of days to go it was worth giving it a shout just in case there where some of you who hadn’t had the chance to vote or didn’t know about the Top vBlog vLaunchPad list organised and maintained by Eric Siebert of vShere-Land. As Eric mentions the vBlog voting should be based on blog content based around longevity, length, frequency and quality of the posts. 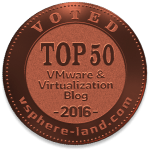 There is such great content creators out there in the VMware community and the 300+ lists of active bloggers is testament to the effort and passion shown by members of the community. As has been the case in previous years, there has been talk of this being a popularity contest and there has even been some other comments around gender participation this year which is disappointing to have around what should be a legitimate way to help recognize the vBlog community. In my opinion the best way to vote was described by @Virten shown below. Filter out non VMware related sites.. However you do it, or have done it good luck to all those who are listed and for those who haven’t voted yet click on the link below to cast your vote. If you feel inclined and enjoy my content around vCloud Director, NSX, VSAN and Cloud and Hosting in general…It would be an honor to have you consider anthonyspiteri.net in your Top 12 and also in the Independent Blogger category.